I've got to admit I'm usually not a huge fan of red meat. You'll never find me ordering a steak or lamb rack for din dins. Seafood, tofu, tempeh, eggs and chicken are my usual go-to options. Sure, I still eat red meats but generally they need to be smothered in a mushroom gravy or hidden in a casserole or bolognese. I'll source a majority of my iron from other foods, thanks. 1. Kangaroo Meat is 'Open Range' - this means the animals are allowed to live in their own natural environment and are harvested without added hormones, chemicals or antibiotics. They live good lives (though you won't find them dressing up in clothes, stopping thieves or saving lives, as Skippy did!). 2. Favourable Kilojoule content - kangaroo meats have a kilojoule (calorie) content similar to that of other lean meats, making them a great inclusion if you are watching your weight. 3. Low fat content - kangaroo meat is considered low fat, especially low saturated fat (saturated is the least favourable type of fat). Did you know kangaroo meat contains less than 2% fat? That is very impressive! 4. Protein - kangaroo is a wonderful source of protein which is crucial for appetite regulation, muscle strength and thus weight management and wellbeing. 5. Omega-3 fats - omega 3 fats are heart-friendly fats which can help to optimise your cholesterol levels and contribute to healthy eyes and brain power! Typically, omega-3 is associated with fish and fish oil, however kangaroo is a great source of omega 3s too- bonus!! 6. B vitamins - remember B1 and B2 from Bananas in Pyjamas? Well, in the nutrition world, we call B1 thiamine, B2 riboflavin and also consider their other B family friends, niacin, B6 and B12. These are the vitamins which keep our blood, brain and immune system healthy. B vitamins also help our bodies to use the energy we put inside them, thus giving us more pep in our step. The good news is that kangaroo is great source of B vitamins, to keep you on tour toes. 7. Source of minerals - kangaroo contains the essential minerals, iron and zinc, which give you energy, help you grow, keep the immune system strong and assist with the healing of wounds (should you have any) and condition of your skin. Sounds great, but where can I get it? - The best news is that kangaroo is easier to buy and prepare than you may expect. I have purchased kangaroo products from Woolworths, Coles and even Aldi. Kangaroo is also available from IGA, Food Land and Supa Barn, according the distributor's (Macro Meats') website: http://gourmetgame.com.au/products/kangaroo/ Macro Meats distributes a variety of kangaroo products, so you can ease your way into eating and enjoying this great Aussie icon. Available are kangaroo sausages ("Kanga Bangas!! "), kangaroo burgers, steaks, meatballs, mince, fillets, roasts, kebabs and diced kangaroo. Such variety! These products are also economical; I buy mine from Coles supermarkets where I've recently been picking up 2 trays of products for just $9!! (individual supermarkets will likely vary). 1. Pre-heat a non-stick fry pan over medium heat. Add crushed garlic, basil, oregano, chilli, pepper. Add the kangaroo meatballs and combine. 2. Flatten the meatballs into 'patties.' Cook for roughly 5 minutes each side, or until browned through. 3. Add the mushrooms and half can of diced tomatoes, combine all ingredients and turn heat to low. Allow to simmer. 4. Meanwhile, prepare a selection of vegetables or salad to serve with the meatballs and salsa. 5. 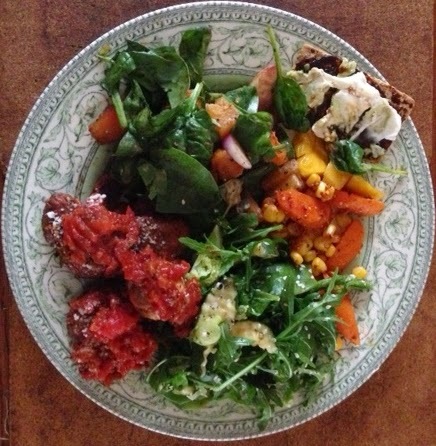 When vegetables or salad is ready, serve kangaroo meatballs, topped with tomato and mushroom salsa. I also like to add a teaspoon of parmesan cheese on top for some cheesy goodness. 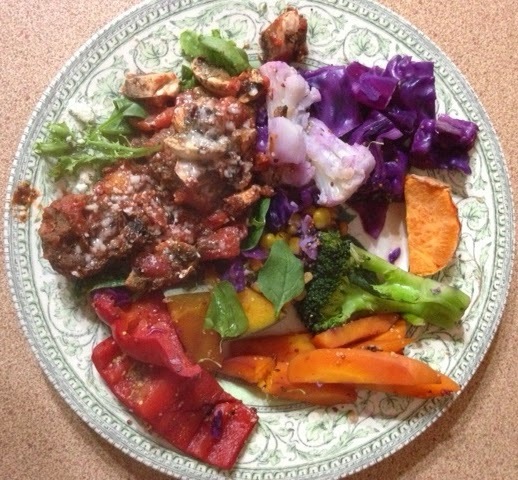 Kangaroo meatballs in my tomato and mushroom salsa with a generous dose of colourful veggies. Eat a rainbow, people!! So good I had to have them for a second (or fourth) night in a row... this time with salad. Kanga! Should you be game (pun intended) to trial kangaroo, I hope you enjoy my recipe. It is such a nutritious and convenient protein option which I highly recommend, so 'get your game on' and cook up some kanga!